We originally published this post back in 2016. Since a lot can change in the online marketing landscape in a year, we’ve updated it for 2017. Throughout the last decade, mobile and online shopping has been on the rise, pushing brick-and-mortar businesses to compete harder for their share of consumers’ dollars. During the 2017 holiday season, eMarketer expects ecommerce sales to grow 15.8%, with total retail growth limited to 2%. The National Retail Federation (NRF) believes overall retail growth will be around 3.7-4.2% in 2017, while online retail will grow 8-12% alone. It’s clear that mobile shopping on smartphones and tablets, rather than brick and mortar shopping, is the new norm. In the United States, consumers are increasingly using their smartphones more hours during the day for shopping, social media, and other activities. Mobile ad spending is on the rise, as marketers realize they need to target mobile consumers even more than through traditional advertising avenues. As mobile data and the online shopping industry grow, vendors and retailers will need to come up with innovative ways to target consumers. As fewer consumers purchase laptops or rely on them as a primary device, tablets and smartphones will increasingly become the primary devices for purchasing, with 31 million US Internet users only using a mobile device to go online in 2016. Comparing two retail giants—Amazon and Walmart—shows the chasm widening between online and brick-and-mortar sales. Amazon posted $82.7 billion in sales for the last 12 months, while Walmart, with its massive physical presence, only posted $12.5 billion. With ecommerce juggernauts like Amazon driving more sales through programs like Amazon Prime, online sales will continue to eclipse traditional brick-and-mortar options, and the online shopping industry will grow. Both these companies are working hard to break into each other’s markets, with Walmart strengthening its ecommerce skills and Amazon its brick-and-mortar abilities. Walmart has purchased Amazon, however, announced its intention to purchase organic food giant Whole Foods and has been opening up retail bookstores in NYC and other locations. These two massive companies make it clear that ecommerce is the future, but brick-and-mortar isn’t dead either. New data shows that younger buyers, especially those with smartphones, are more likely to use mobile devices for shopping compared to older consumers. 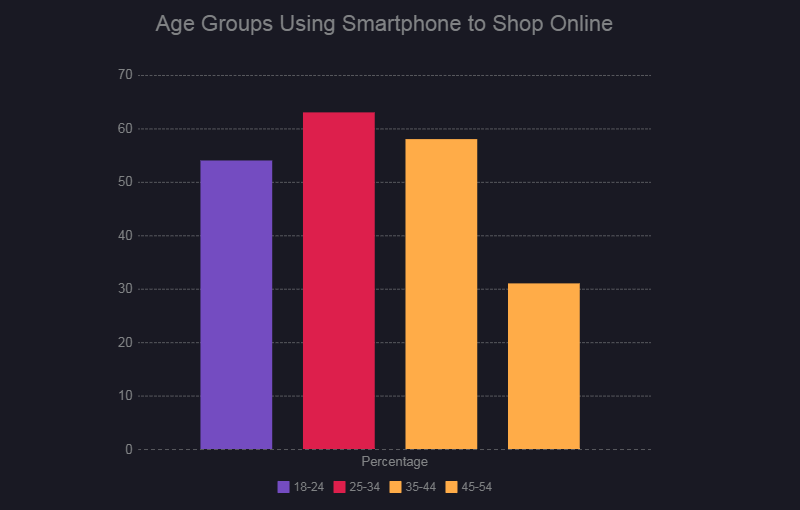 In a 2016 Bronto survey of over 1000 people, 65% of adults ages 18-24 say they use their smartphones for shopping, as do 63% of those ages 25-34, and 58% of those aged 35-44, with the numbers dropping significantly as age increases. 35-44-year-old people are more likely to purchase on tablets, with younger consumers not using those devices as frequently. As age increases over 44, these numbers decline. What these statistics suggest is that most mobile commerce growth is driven by the 18-34-year-old segment of the population, with less push from older American adults. As an increasing number of millennials accrue wealth and enter the workforce, mobile sales will continue to grow and overtake online sales from computers and eventually brick-and-mortar entirely. Online shopping growth, especially on mobile, is a force that will only increase as the conveniences of shopping from your home and online-only deals eclipse any advantages brick-and-mortar stores retain. Millennial shoppers are pushing this evolution, and the next generation will only further it. Consumer trends suggest that mobile sales are the new norm. Mobile devices, especially smartphones, are convenient to use and able to fit in your pocket, and retailers are providing seamless app experiences for purchasing on their platforms. Tablets are also a significant part of this growth, to a lesser extent, among adults in the 35-44-year old range. 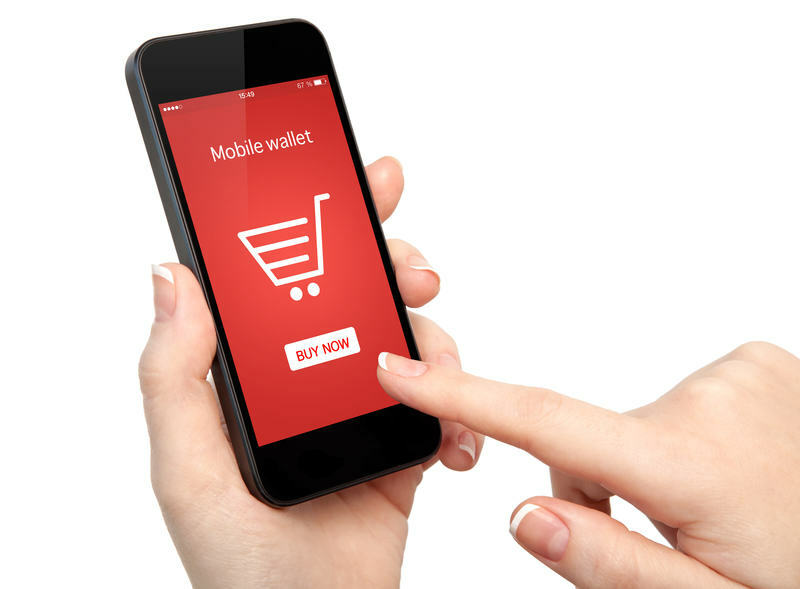 Mobile commerce growth is inevitable, and it will overtake brick-and-mortar. The only question is when. With giants like Amazon reporting close to $100 billion in annual sales and growing, retailers and advertisers must pursue solutions to engage with mobile consumers in innovative ways. While brick and mortar stores are still relevant for the foreseeable future, Walmart and similar large retailers must continue to adapt to stay in business. At Leverage Marketing, we employ pioneering techniques to further your company’s digital marketing efforts We can help your ecommerce business create a mobile-friendly design that adapts to smartphone and tablet design. Learn more about our web design services and contact us today.